7 healthy Valentine's Day treats that are still super sweet. Valentine’s Day is all about sweets for your sweets, but while conversation hearts and chocolates are classic go-to’s, I’m thinking that fruit is a good way to have a few healthy Valentine’s Day treats in our collective back pockets. Or if not quite healthy—I mean, these finds are not quinoa bowls or kale chips in the shape of hearts—at least these treats are healthier than chalky conversation hearts or fun-size chocolates. All 7 of these treats are made with fresh fruit and still manage to be festive and delicious. And yes, still sweet and indulgent enough that your kids will totally love them, too. Related: 5 super cute and very easy edible Valentine’s Day projects for kids. When I look at these Chocolate Chip Stuffed Raspberries at Sweet Paul, I’m amazed that raspberries don’t always come with a chocolate chip inside. I mean, how perfect are these? 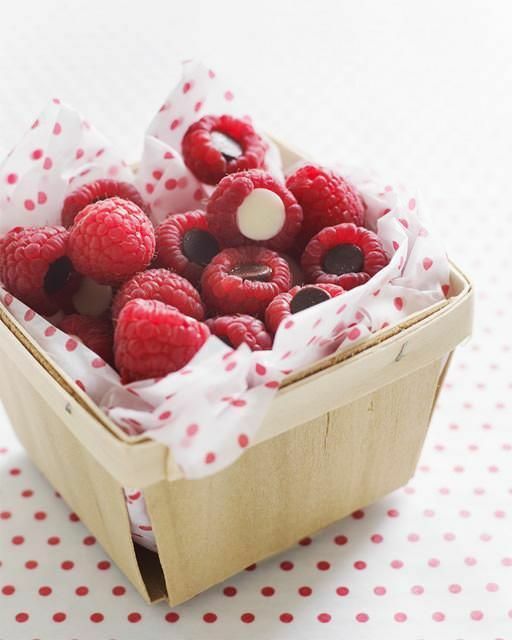 Chocolate chips fit just perfectly and taste surprisingly delicious combined with fresh, juicy raspberries. Especially white chocolate, yum. While these bite-sized snacks may make a lovely, healthy (ish) Valentine’s Day treat, I have a feeling I’ll be serving them all year around. 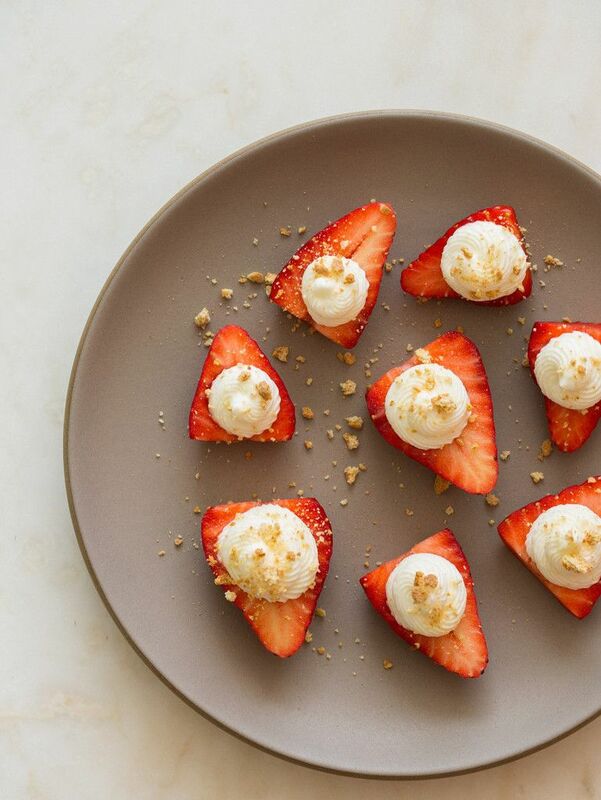 These Deviled Hearts at Spoon Fork Bacon are a fun twist on no-bake cheesecake-stuffed strawberries that are perfect for Valentine’s Day. Even more perfect: You can make a big batch in just 15 minutes. These are great for a Valentine’s Day party or just a sweet snack or dessert for your family. I have a feeling these will go just as fast whether you’re sharing them with 3 or 13 others. 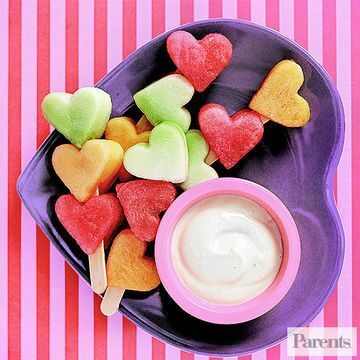 Grab a heart-shaped cookie cutter to whip up these super cute Heart Kabobs at Parents. Despite how crafty these look, that’s really all it takes. Then, thread heart-shaped pieces of fruit on a popsicle stick and serve with yogurt. Easy, breezy. 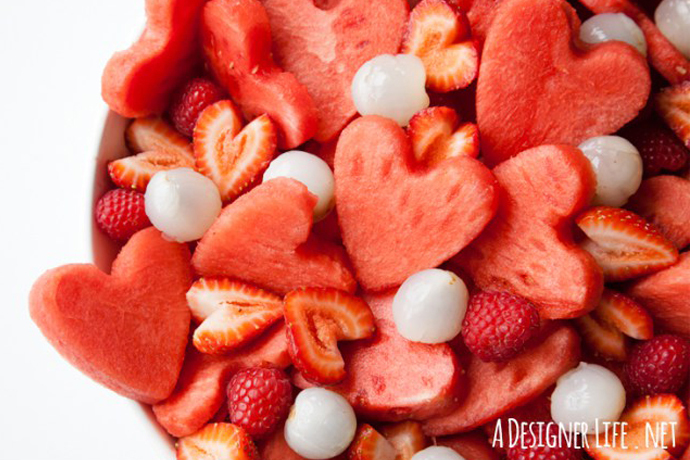 If you’d rather skip the stick—or are feeding a crowd—cut watermelon into hearts to make this pretty Watermelon Heart Salad (above & top) at A Designer Life instead. Jess doesn’t specify what the white fruit is, but I think it works so maybe try using a melon baller on honeydew or, for a super sweet surprise, use canned lychees if you can find them. Related: 8 easy homemade Valentine’s Day food gifts. 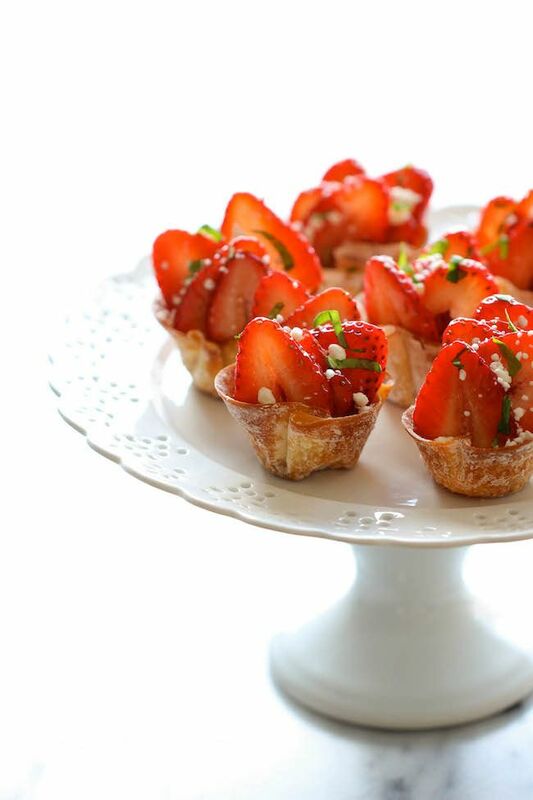 The Strawberry Wonton Cups at Damn Delicious are a savory bite made with balsamic vinegar and goat cheese. While that sounds delicious—and perfect for the grown ups—just skipping the cheese turns them into something sweet. Why not make them both ways and let people choose. Or even better, set out other toppings and let your love bugs make-their-own. I’m thinking a dab of Nutella on the bottom of my wonton cup might do me right. 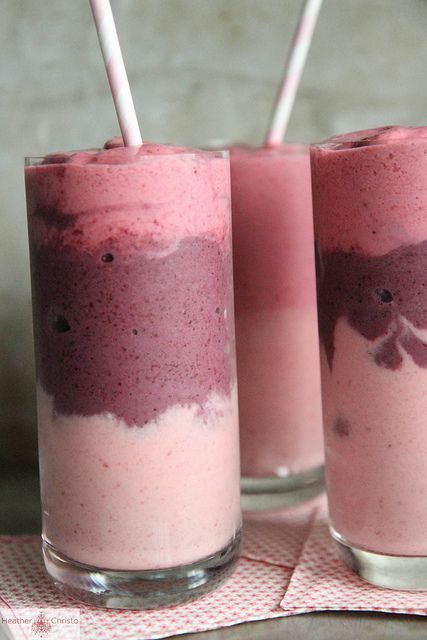 If yours is a smoothie-a-day family, we featured this delicious Berrylicous Smoothie in our roundup of easy, last-minute Valentine’s Treat recipes that you can whip up with minimal effort. With pretty pink ombre layering, it feels a bit more special than your everyday morning fruit blend. Plus, it’s made with just berries, bananas, and vanilla — no greens in sight — which is enough to make my kids love me just a little bit more. Move over roses! 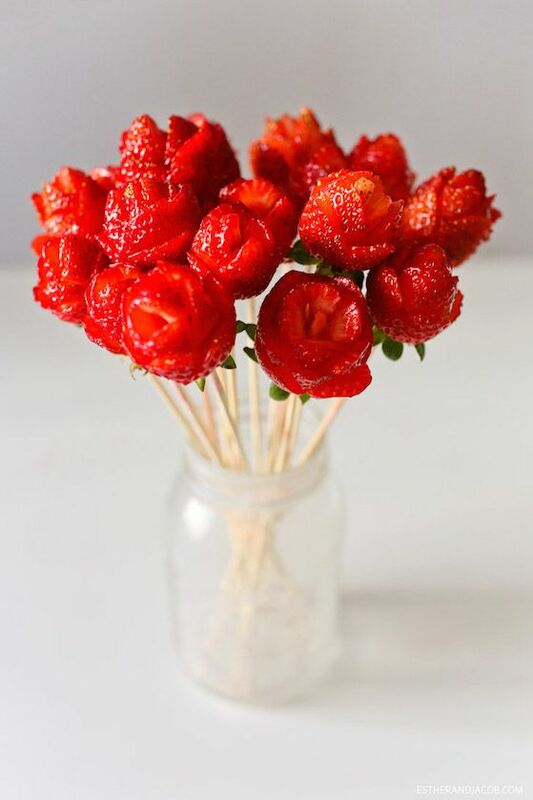 If you’re crafty, you have to try making the hand-cut Strawberry Flowers that we found at Local Adventurer while looking for super impressive fruit recipes for a party. They are so pretty, and definitely a healthy Valentine’s treat since really, it’s just strawberries. You can do this provided you’ve got the knife skills to keep them from looking totally butchered. (Yikes.) I think I’ll just dunk my strawberries in chocolate, but for those of you who can make these happen, the payoff will be sweet. thanks so much for including our post! 🙂 a friend of mine has made those chocolate stuffed raspberries before, and they are delicious! 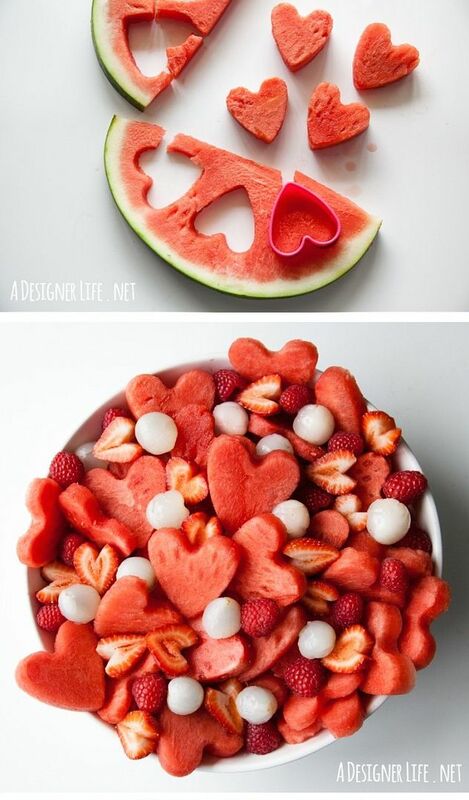 the melon hearts are so cute too!